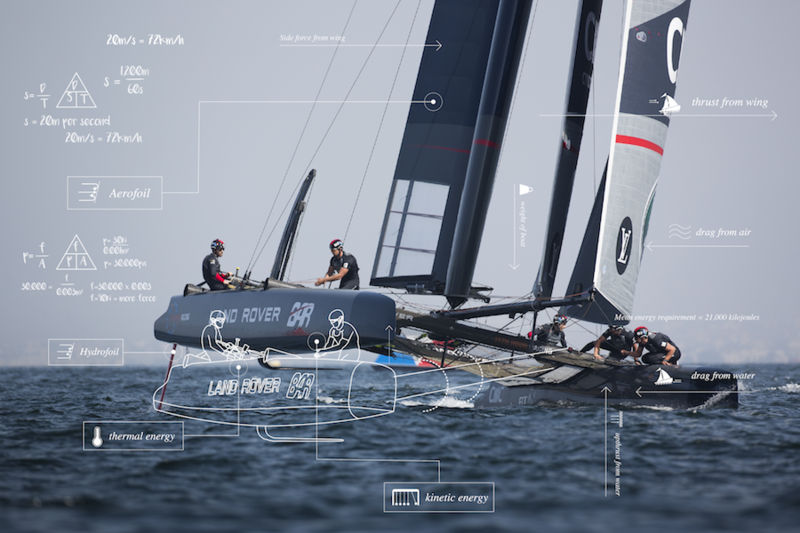 A thousand sensors spread over three boats collecting 16 gigabytes of data each and every day. A hundred terabytes analysed annually. 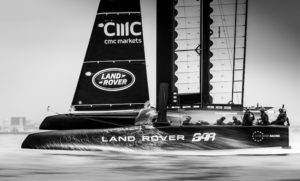 Multihulls and their spectacular foils have radically transformed the America’s Cup in which technology is playing an increasingly pivotal role. 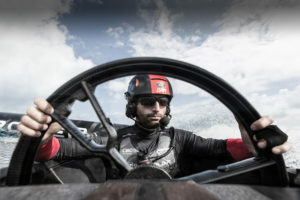 The dramatic developments of the 34th America’s Cup, however, are a drop in the ocean compared to the innovations that await us in Bermuda in a few months’ time. The progress made in the interim has been nothing short of monumental as the new ACC proves. 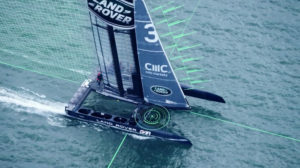 Team Land Rover BAR’s approach speaks volumes about the extent to which the America’s Cup has been upped its technological game as the Sir Ben Ainslie-skippered British team is availing of Land Rover’s enormous automotive experience to hone the design of the multihull it will field. “Being a great sailor isn’t enough to win the America’s Cup these days, if you can’t count on a fast boat,” says MIT graduate and engineer Mauricio Munoz who is lending his self-learning car expertise with Jaguar Land Rover to the project. A scenario that sees the car of the future meet the boats of the present. 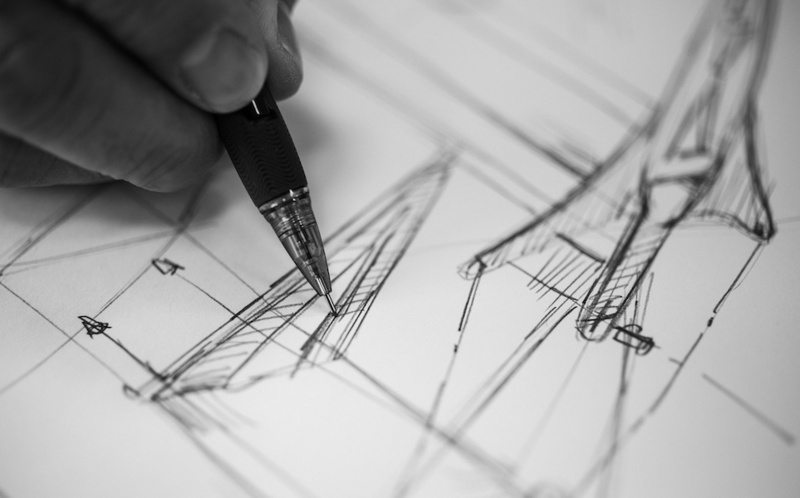 Munoz is working hand-in-glove with the design team and crew on the project. 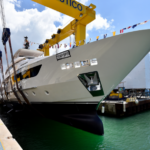 “The exhilarating part of this project is analysing data to improve the boat’s performance while taking into account the many, many variables involved that can impact it. For example, even if you sail the boat on two different days in essentially the same conditions, you’ll get different figures. We are aiming to analyse this enormous quantity of data to find the answers we need using machine learning and AI,” adds Munoz. 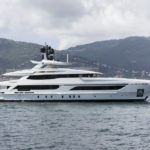 There is literally no room whatsoever for error when you are dealing with 15-metre boats that actually fly in the true meaning of the word at over 85 kilometres an hour thanks to a rigid sail that’s the same shape and dimensions as the wing of a Boeing 737. Comparisons have been made, in fact, between the current America’s Cup and Formula 1. “It’s true there are many similarities,” says Team Land Rover BAR CEO Martin Whitmarsh who himself has 25 years’ experience in F1, many of those spent as team principal of McLaren. “The search for performance and the use of sophisticated materials are just a couple of areas that these two worlds have in common”. There is one big difference though: in Formula 1, the single-seaters race on a very clearly-defined track and the better the grip, the better the cars perform. In the America’s Cup, conversely, friction is reduced to an absolute minimum to allow the hulls to literally fly over the surface of the water on a much less clearly-defined course where factors such as wave motion and wind also wield an influence. Flying a 15-metre craft that displaces only a few tons at a staggering 85 km/h is a hugely complex operation. 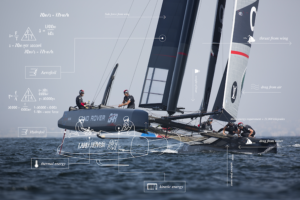 Aerodynamics, computational fluid dynamics and man-machine interfaces are becoming increasingly part of the equation and are blurring the lines between the car and sailing worlds. This is where Land Rover comes in. 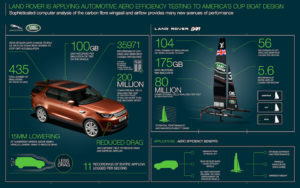 Its technicians set to work on the sailing team’s giant 23-metre tall fixed wing, lavishing all the aerodynamics and computer technology expertise they’d built up designing the likes of the new Discovery on honing it. 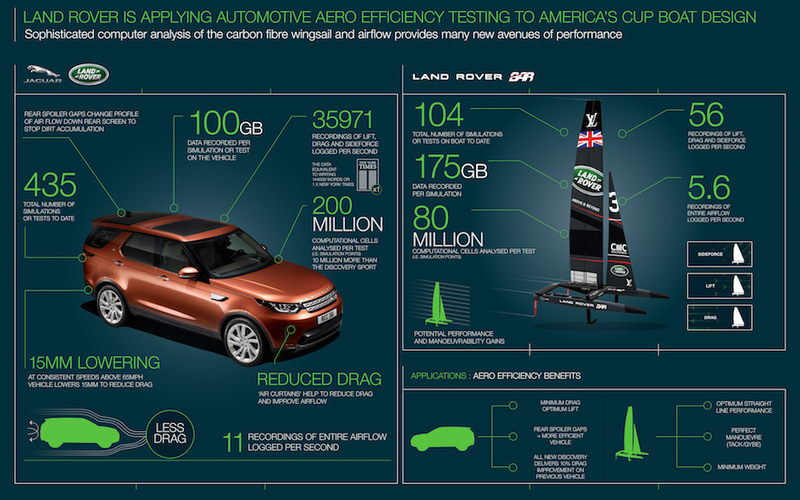 Specifically, they used a special programme to monitor the wing’s dynamic performances in detail with 80 million computational cells analysed per test. The BAR Americas Cup Team. The results will be pivotal to the Cup results. “This procedure is very similar to what we do Jaguar Land Rover when we’re studying vehicle responses at high speeds,” says Tony Harper, Director of Research at Jaguar Land Rover. “However, in that instance, our goal is to minimise the effect of aerodynamic deformation on the car’s surfaces, to keep fuel consumption down”.